The only downside is that when they update on Sunday they don't archive the past post cards. 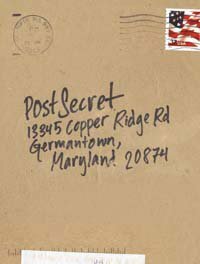 Post Secret is a great thing isn't it... I haven't sent a post card, but just thinking about it has helped me realize truths about myself. I'm sorry to hear about Gala kitty. I know how painful it is to lose a pet - pets are family. I hope it is peaceful when the time comes.